Try one of these fantastic Thai recipes and grill up something dazzling for your family and friends. You'll love the traditional chicken satay (not to be missed by anyone who loves Thai! ), plus find recipes for grilled fish, BBQ chicken, grilled shrimp, steak and ribs, grilled vegetables, even grilled dessert. As a bonus, many of these recipes can be made in your oven or on top of your stove - nice to know in case the weather doesn't cooperate. Enjoy! If you're a steak lover and never had a Thai-marinated steak, be prepared to find yourself hooked on it -- and never seasoning or marinating a steak any other way. This is exactly what happened to my husband who used to order steak regularly in restaurants but now passes them by on the menu because they just can't compete with this recipe. I heartily agree. This marinade reigns supreme. Give it a try and you'll see what I mean. This Thai version of Honey Garlic Chicken turns ordinary chicken breast or thigh into an amazing tasting meal, plus it's super-easy to make. Here I've grilled it, but it's just as wonderful baked in the oven in case the weather doesn't cooperate (both methods included here). Makes a great dinner served together with rice or over a salad, or whatever side dishes you desire. Best Ever Thai Grilled Lemongrass Chicken - Traditional Thai! This lemongrass grilled chicken blows other recipes out of the water. Plus it's super simple to make. Just toss a few ingredients into your food processor, marinate, and grill. At our home, we like ours medium-spicy, hence the 2 chilies in the ingredients list, but feel free to adjust this according to your own spice-o-meter. Serve it up with rice or over salad; there's no need for a side sauce, it's that flavorful! My Mother-in-Law's Secret Satay Recipe! My mother-in-law did give me permission to publish her satay on the internet, so I'm not as poor of a daughter-in-law as you might imagine. However, her family secret is obviously a secret no longer - and with a taste like this, it shouldn't be a secret. You're quite simply going to be blown away by the succulent taste of this satay recipe (better than any restaurant). Strips of chicken or beef are marinated in a special Thai paste, then skewered and grilled on the BBQ, grilled on an indoor grill, or broiled in your oven. Serve with her homemade peanut sauce for the ultimate taste experience (recipe included). A great summer party food! Summer shrimp are delicious when grilled on the barbecue, and this Thai version is especially superb! You have to try it to know what I'm talking about. Perfect for a barbecue party, whether you want to go casual, or gourmet! Excellent paired with either a cold lager, or a chilled glass of your favorite white or rose wine. If you've ever been to Thailand, you know how amazing the BBQ chicken tastes, whether it's cooked on a streetside brazier or a fire on the beach. Well, here is the recipe direct from Thailand! Marinated first in a garlicky sweet and sour sauce, the chicken is then easily barbecued to perfection. Add the signature sweet, sour, and spicy side sauce, and your taste buds will be dancing in no time. This Thai Grilled Chicken Salad has been said to make grown men cry (see reviews for this recipe for more on this!). It starts with strips of chicken breast marinated in a garlic-pepper sauce. The chicken is then either grilled on your barbecue or oven broiled. Place over a bed of summer greens that has been tossed in a lemongrass-coriander-lime dressing, top with a sprinkling of fresh basil, and you have a complete meal that is so Thai-delicious, you'll want to make it your number one salad this season! This Thai Grilled Shrimp is extremely flavorful and is sure to please anyone who loves Thai flavors. Scallops can also be added to your skewers if you wish. This is now my husband's favorite shrimp recipe. Give it a try! This Thai recipe for grilled halibut steak is easy and can be made with other types of fish as well. The Thai marinade is put together in a matter of minutes, and as a bonus, it doubles as a dipping sauce. This grilled fish recipe makes a quick and easy meal for every day but is also elegant enough to serve at your next barbecue or cookout party. Enjoy! If you like good BBQ chicken, Thai Barbecue Chicken is something you'll want to try. It's simple to make, and the results are stupendous. Includes a special marinade that imbues the chicken with taste and gives it that beautiful reddish barbecue color. Serve with a quintessentially Thai sauce that is super-easy to make (no cooking involved!) and gives your BBQ chicken that extra hit of flavor. Traditional Thai Grilled Whole Fish with Coriander-Chili Sauce! This fish recipe can be made outdoors on the barbecue, or you can pan-fry the fish indoors (or grill it on a stove-top grill). You'll love the tenderness of the fish combined with this fantastic, taste-bud-awakening sauce, which can be made anywhere from mild to extra spicy to suit your taste. And nearly any whole "white-fleshed" fish can be used for this recipe (here I've chosen rainbow trout, but feel free to substitute whole snapper, sea bream, talapia, gray mullet, or the fish of your choice). ENJOY! This Thai chicken salad is easy to make and pops with flavor. As a bonus, it's low in calories and fat while remaining extremely high in taste. The chicken is marinated in a light peppercorn marinade, then grilled (or oven-broiled) and served over a bed of cool greens together with a tangy Thai dressing. This fantastic recipe for grilled salmon is easy to make and tastes truly heavenly. The special Thai marinade is a perfect match for the richness of salmon, enhancing and bringing out all of its naturally succulent taste. This recipe will show you how to cook salmon easily and quickly, and includes lots of cooking tips to help you get your salmon just right. For best results, look for wild fillets of salmon, or salmon steaks. Finish this dish with a no-cook coconut sauce, and you have the perfect salmon recipe for your barbecue or cookout! Ready for a new Thai dessert you can make right on your barbecue? Then try this easy recipe for Grilled Pineapple Dessert! Fantastic is the only way to describe the taste of this fresh dessert idea. Includes all the instructions you will need to buy and cut a fresh pineapple (it's very easy to do!). While fun to eat, this can also be a very gourmet dessert, especially when dressed up with shredded coconut and paired with a coconutty dipping sauce (recipe included). Also, includes make-ahead tips, so you can easily serve this dessert recipe at your next barbecue or dinner party. If you've ever wondered what satay is, exactly, here's your chance to find out - plus, get a real Thai satay recipe at the same time. 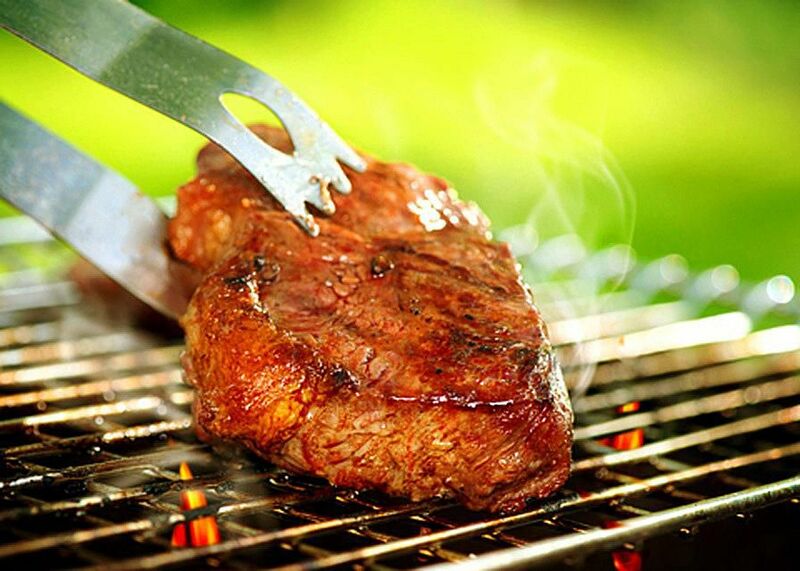 Here's to the world's greatest grilling!